Cody Willoughby | AIM Media Midwest District curriculum director Scott Bloom discusses coding with Haylie Schultz, Arabelle Simmons, and Kaylie Hittle during LEGO Club on Tuesday at Piqua Central Intermediate. Cody Willoughby | AIM Media Midwest Owen Fast, Brycen Angle, and Jacob Jansbold engage in construction techniques during LEGO Club on Tuesday at Piqua Central Intermediate. Cody Willoughby | AIM Media Midwest Alexis Lee, Owen Snyder, and Elijah Hasselback explore coding applications during LEGO Club on Tuesday at Piqua Central Intermediate. 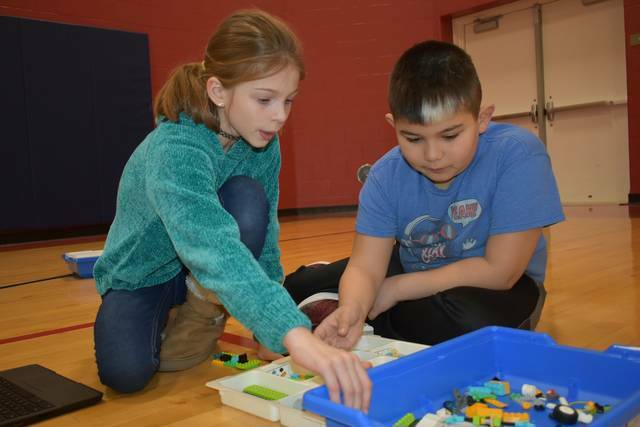 PIQUA — Fourth, fifth, and sixth graders keen to put their creative and scientific brainpower to good use now have an outlet in their school’s new LEGO Club. The program, which premiered this year at Piqua Central Intermediate School, has attracted approximately 50 students. “We opened it to everybody who wanted to come,” said instructor Veronica Gaier. Every second and fourth Tuesday of each month, participating students engage in various step-by-step processes of assembling LEGO creations, which including working mechanisms and coded computers. Categories for building include Mindstorm, We-Do, and simple machines. The program was funded entirely through grants from federal programs and local philanthropic groups, as organized by Curriculum Director Scott Bloom. ”I think it’s fun to create, and see something that you made walk or drive,” said sixth grader Owen Fast. With this being the program’s inaugural year at PCIS, Gaier hopes to get both students and program leaders oriented to the process of construction and coding, so that in the 2019-20 school year, Piqua Central can compete at the district level in FIRST — For Inspiration & Recognition of Science & Technology — LEGO League tournaments. For more information on LEGO tournaments, visit www.firstlegoleague.com. 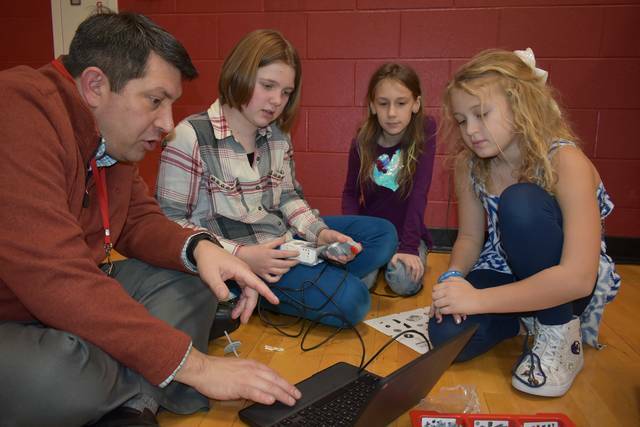 https://www.dailycall.com/wp-content/uploads/sites/30/2019/02/web1_LegoRobotics4-WEB-1.jpgCody Willoughby | AIM Media Midwest District curriculum director Scott Bloom discusses coding with Haylie Schultz, Arabelle Simmons, and Kaylie Hittle during LEGO Club on Tuesday at Piqua Central Intermediate. 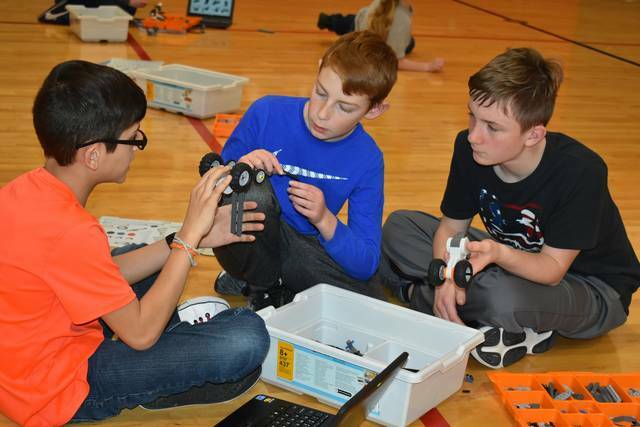 https://www.dailycall.com/wp-content/uploads/sites/30/2019/02/web1_LegoRobotics1-WEB-1.jpgCody Willoughby | AIM Media Midwest Owen Fast, Brycen Angle, and Jacob Jansbold engage in construction techniques during LEGO Club on Tuesday at Piqua Central Intermediate. 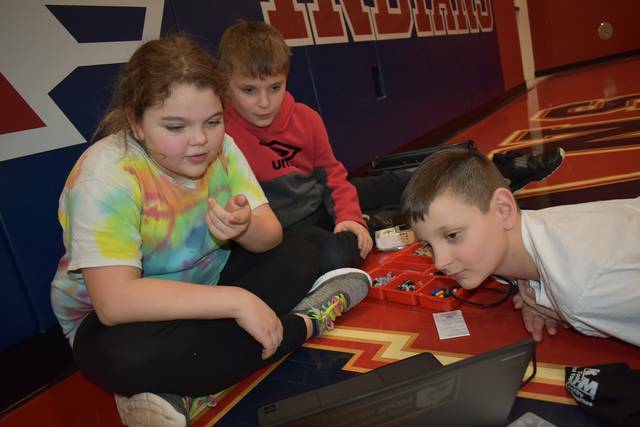 https://www.dailycall.com/wp-content/uploads/sites/30/2019/02/web1_LegoRobotics2-WEB-1.jpgCody Willoughby | AIM Media Midwest Alexis Lee, Owen Snyder, and Elijah Hasselback explore coding applications during LEGO Club on Tuesday at Piqua Central Intermediate.